The winning team at Graham’s second annual wing eating contest was the Wing Commanders, comprised of school employees and community members. From left are Graham Superintendent Kirk Koennecke, Zac Fiely of Edward Jones, Lorie Hale of the United Way, Jeremy Sigler of Security National Bank, Graham Director of Student Services Emily Smith, Chris Winch of Winch and Associates, Graham Administrative Assistant Kristie Purtee, Freddie Falcon and Kerry Pedraza of the United Way. 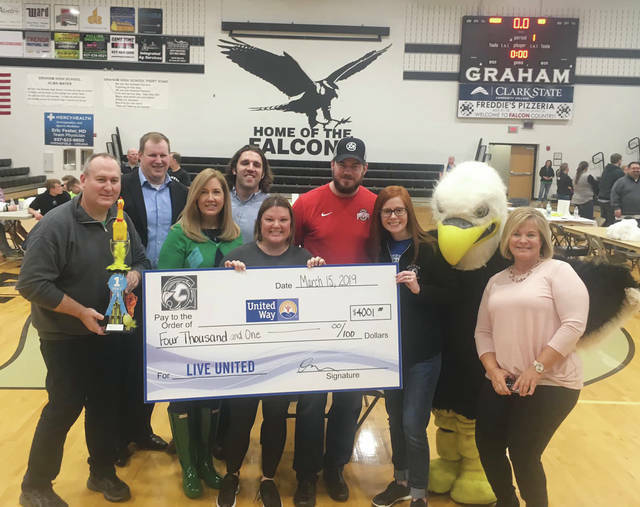 ST. PARIS – On March 15, Graham Local Schools hosted the 2nd annual Wing Contest in the high school gymnasium to raise money to support United Service Day 2019 and Champaign County’s Literacy Foundation. Twelve teams consisted of students, staff and community members. Appreciation was expressed for participants’ attendance and fierce wing eating skills. In order to participate, adults had to raise $100 each and students had to raise $20 each. The district continued a partnership with Fricker’s, Springfield location, to make the wing contest possible. “We are happy to support Graham and we look forward to this event,” said Jen Lewis, regional manager for Fricker’s. As part of the event, Graham raised $4,001 for the Champaign United Service Day and the Champaign County Children’s Literacy Foundation.